Bank of Hope’s gift supports CSUN VITA Clinic, which provides income tax preparation assistance to low-income families and individuals. Photo by Lee Choo. Bank of Hope has given California State University, Northridge $25,000 to support the university’s income tax preparation assistance program for low-income families and individuals. 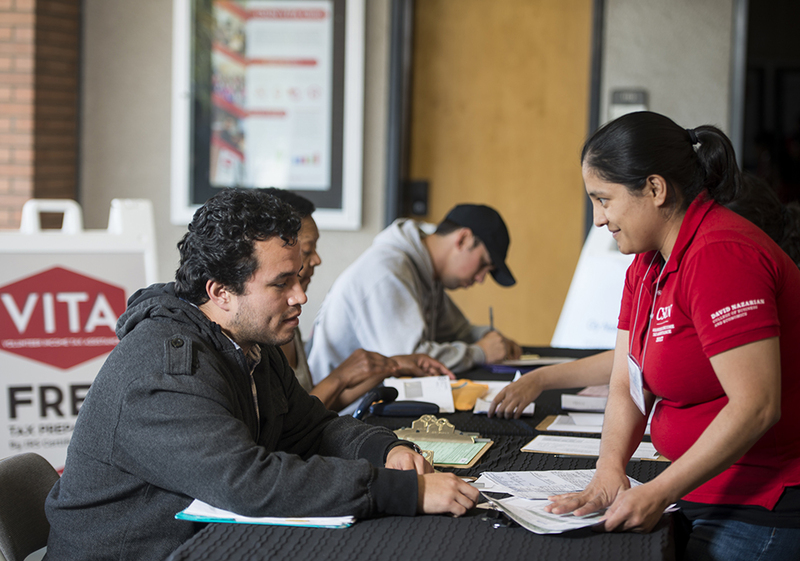 The money will support the operations of CSUN’s Volunteer Income Tax Assistance (VITA) Clinic during the 2019 tax season. In addition to the money, bank employees have volunteered to serve as interpreters and greeters at many of the clinic’s sites throughout Los Angeles. CSUN’s VITA Clinic began offering its services to low-income members of the public on Jan. 28. Its program will run through April 13 at CSUN and satellite locations throughout Los Angeles County. VITA Clinic locations can be found at vita.csun.edu. Headquartered in Los Angeles, Bank of Hope has been providing financial services to the largest Korean-American community in the country for nearly four decades. Today, Bank of Hope serves a multiethnic population of customers through 64 full-service branches across nine states; eight Loan Production Offices add a presence in two additional states. Launched in 1971, the CSUN VITA Clinic, located in CSUN’s David Nazarian College of Business and Economics, serves as a valuable community partner that is responsive to the culturally diverse San Fernando Valley. While there is a maximum gross income limit per tax return, it’s usually set by the IRS at $54,000, about the average income of a Los Angeles resident. For more information about CSUN’s VITA Clinic, including locations and qualification for its services, visit its website at vita.csun.edu.